This graph is called a “production-possibility frontier” (PPF), or “production-possibility curve (or 'boundary')”, or “product transformation curve”. It shows various combinations of amounts of two commodities that could be produced using the same fixed total amount of the factors of production. Rather than strictly economic ones, the commodities depicted here (the two axes) are political commodities; allocation, distribution, and planning by means of corporate bureaucracy, versus allocation by means of socialist bureaucracy. The purple dot ("Centrism") represents where we are now; at a state with imperfect liberty, imperfect equality, and a mixture of socialist and corporatist bureaucratic planning. The goal is to find a balance between socialist and corporatist planning, without sacrificing either liberty or equality, and if possible to increase both liberty and equality. Any action which achieves this goal is a Pareto improvement, or “an increase in Pareto efficiency” (a change to a different allocation that makes at least one individual better off without making any other individual worse off; shown in light gray), and any action which fails to achieve this goal is not a Pareto improvement (shown in darker gray). 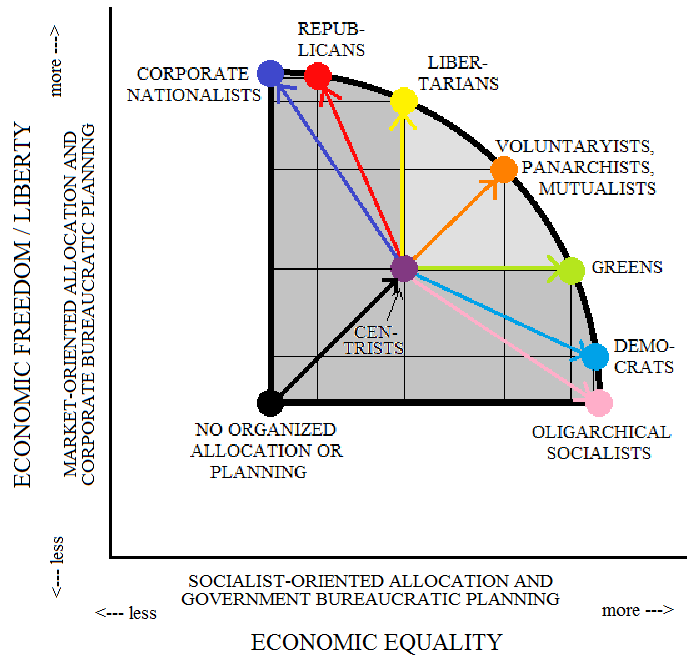 Although a move from Centrism to Corporate Nationalism (dark blue) or Republicanism (red) would increase liberty and the organization of corporate bureaucracy, it would involve a loss of economic equality and a decrease in the organization of socialist bureaucracy; therefore such a move would not be a Pareto improvement. Although a move from Centrism to Oligarchical Socialism (pink) or Democracy (light blue) would increase equality and the organization of socialist bureaucracy, it would involve a loss of economic liberty and a decrease in the organization of corporate bureaucracy; therefore such a move would not be a Pareto improvement. A move from Centrism to Libertarianism (yellow) would increase liberty and the organization of corporate bureaucracy, without affecting equality or the organization of socialist bureaucracy. Because this would make “at least one individual [or the production of at least one good; namely, corporate bureaucratic planning] better off without making any other individual[s, or goods; namely, equality and socialist bureaucratic planning] worse off”, it counts as a Pareto improvement. A move from Centrism to Green-partisanship (green) would increase equality and the organization of socialist bureaucracy, without affecting liberty or the organization of corporate bureaucracy. Because this would make “at least one individual [or the production of a good; namely, socialist bureaucratic planning] better off without making any other individual[s, or goods; namely, liberty and corporate bureaucratic planning] worse off”, it counts as a Pareto improvement. A move from Centrism to Voluntaryism / Panarchism / Mutualism (orange) would increase the organization of both corporate and socialist bureaucracy simultaneously and equally, while simultaneously and equally increasing both liberty and equality. Once any of the dots on the curved line has been reached, a move toward any other location on the curved line would satisfy Pareto optimality. It is important to remember that just because an arrangement is optimal, it does not mean that it is necessarily the best, or that it can be objectively described as the best, or as better than others. This is because it is impossible to maximize for two variables at once. Optimality is simply the selection of a best element, with regard to some criteria, from some set of available alternatives. Anyone promoting a set of criteria would choose a “best” based on his own values and politicoeconomic goals. I think there are probably some republicans who would argue, vehemently, that moving towards their area of the graph would only result in things getting better. That kind of brings up the question - how do we actually know that moving towards a polar end of the spectrum always results in a loss of something? Or is that just what we're assuming for the moment to help illustrate the concepts? Also! What do you think about ideas such as the Venus Project, where everything is automated with the aim of making money obsolete? I can see how socialist would totally dig that... but how would a corporate nationalist culture survive? It's just what we're assuming for illustration's sake. If "libertarian" means Ron or Rand Paul, then we might experience losses of economic equality, but at that, in some policy areas but not in others. And a Green administration would probably improve many (although probably not all) individual civil liberties. I'm not too familiar with the Venus Project. I do like the idea of a new industrial revolution with individuals possessing Thingmakers etc. as a way of increasing egalitarian access to the means of production, which is one of the conditions necessary for perfect and complete markets leading to equality. I discuss my views on currency - specifically gold - a bit in my post "An Anarchist Kindergarten: An Open Letter to Noam Chomsky". I should write something about how to fulfill the practical aspects of physical currency, explaining why some aspects are not necessarily good things. For example, society derives few benefits from the freedom of a billionaire who is the beneficiary of government largesse to access all his money by simply carrying a few credit cards around. For some purposes, the ease of carrying money is hazardous to the freedom of markets. I feel that a corporate nationalist culture can only survive by promoting the interests of autocrats over individuals, and subsidized corporations over enterprises, and also by compelling unwilling people to contribute funds to government.